Mural pictured: We Rise! Children, Trauma, and Resilience © 2013 City of Philadelphia Mural Arts Program / Josh Sarantitis. 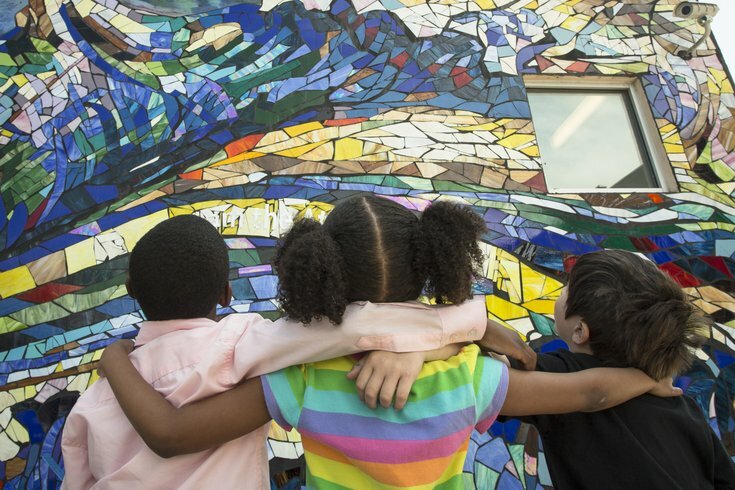 The Philadelphia Mural Arts Program brings much-needed color and life to a city filled with blank canvases. Supporters of the program are invited to the annual Wall Ball, the program's big fundraising event, which takes place at the Electric Factory on Thursday, May 21. The 2015 Wall Ball is all about "planting the seeds of change" and sparking ideas that positively affect communities - this year's paper invitation could even be turned into a mini planter! Live art battle company Secret Walls will provide entertainment for the evening, pitting teams from Philly and New York City against each other in a tag-team event. Together they'll create urban art to be auctioned off at the end of the night. In addition to cocktails, food, auctions and live entertainment, the night also includes three special honorees. Tony Schneider, Mural Arts Advocates Board Member, Connor Barwin, Philadelphia Eagles Linebacker and Caledonia Curry, aka SWOON, Tony Goldman Visionary Artist Awardee will all be honored at Wall Ball. The Off the Wall After-Party, presented by the Mural Arts Young Friends Collective, will go down after the main event from 10 p.m. to midnight.